Public sector executives, managers, supervisors and staff, who have difficulty coping with reading workloads, will be able to process that information much more efficiently. You will learn to read 2, 3 or even 4 times faster than they normally read, and will have the potential to comprehend more with greater recall, depending on your aim. To read more efficiently and effectively becomes a natural skill with ongoing practice. As well as Australia, where this program was originally developed over 30 years ago, it is now being run in nine countries around the world. For those thinking of a one day program, we have found that the results mentioned above are not achieved in one-day, as most people reach their Peak Performance on the second day. This is partly due to the subconscious brain working on the lessons learnt whilst asleep. 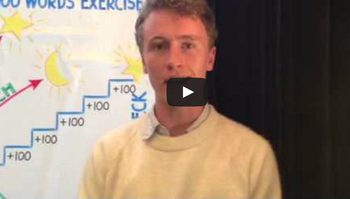 A senior executive from an oil company calculated that this workshop saved him 8 hours a week! How would you like to save at least 3/4 hours a week on an ongoing basis? To achieve the results mentioned above we run a carefully designed program which uses many different tools to break down the bad habits of a lifetime! These include eye exercises, at least eleven comprehension exercises for you to monitor your progress, as well as extensive use of a Reading Rate Accelerator. Thanks for providing this highly valuable course! I learnt lots of practical and effective techniques to help me improve my reading speed (I went from 300 words per minute to 1000) with high comprehension. I have lots of professional reading to do and your course is helping to reduce the time that this would normally take. The 2 day program is definitely an investment for the time-challenged! It would be difficult to gain the same benefits from a one day versus two day workshop given the range of “building blocks” that you cover, plus assessments and practice. I would highly recommend this program – I only wish that I had done it years ago! Paul Chatfeild-Clarke lives in Perth WA and has been a training and development consultant for 21 years, prior to that he held several managerial positions. He was a local director of an international training organisation for 10 years, and set up his own consultancy in 1995. He has Certifcate IV in Assessment & Workplace Training. Paul has over 20 years experience designing and running skills based training programs for State and Federal Governments and the Corporate Sector, in the areas of Public Speaking & Business Presentation Skills, Report & Business Writing for Government, Power Reading, as well as Leadership and Teambuilding. The workshops are competency based, interactive, experiential, highly practical, personalised, fun and the skills learnt are immediately transferable into the workplace. Chatfeild-Clarke Consulting was formed in 1995 by Paul Chatfeild-Clarke. Our most popular courses are Business Writing, Dynamic Presentation Skills & Speed Reading. The workshops are interactive, fun and immediately transferrable into the workplace. Delivering customised, interactive and engaging inhouse training in productivity and communication, leadership and change, customer service and sales. How many of your people are under pressure to get through mountains of reading that just keeps pouring in? Double your reading speed, guaranteed. Speed Reading training is a proven tactic for mastering information overload and can be learned in one day. In our one-day Speed Reading workshop we guarantee we’ll double everyone’s reading rate. Many people increase 3 times or more without loss of comprehension, (measured). For a custom quote contact us here. The Brainpower one-day Speed Reading course is an award-winning program for individuals and teams who want to capture information faster and easier. You’ll learn practical strategies you can use immediately to slice through your reading pile. How to read more in the next 90 days than in the last 9 years! By understanding and mastering these skills, you can easily double, or better, your reading rate. Does the training include any additional materials? Yes. All workshop participants receive a reader-friendly, illustrated, colour-printed Workbook to refer to during and after the course. How does speed reading help? Anyone with tons of reading to get through – managers, executives, students, etc. Does speed reading really work? The average person reads between 200 – 300 words per minute. After attending our workshop, everyone at least doubles their reading rate without loss of comprehension or accuracy. Many people increase by 300 to 400 percent with the same, and often better, understanding and memory. Around 9% of participants increase by 6 to 10 times. 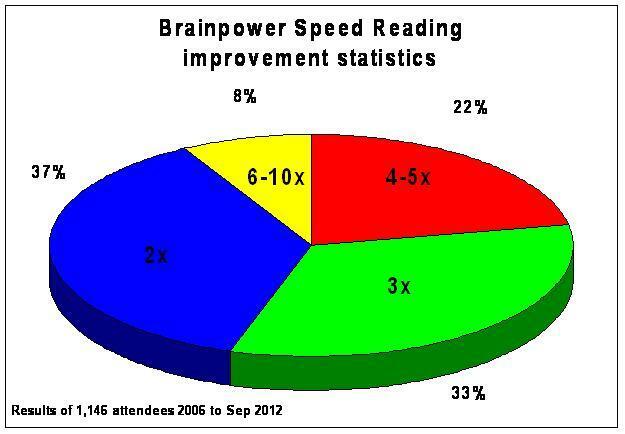 Refer to the table and corresponding pie chart below for improvement statistics of 1,320 participants (100% of all results) attending Brainpower Training speed reading workshops during the period: 2006-2014 (July). with same or improved comprehension and memory, as measured. These results may seem amazing (and they are) but using the techniques covered in the course you’ll be surprised how easy it is to become a ‘speed reader’ yourself. But how is it possible to read so much faster and still understand what I’m reading? ‘Regression’ – when your eye unconsciously flits back to reread part of a word. Eye movement research reveals the average person regresses as many as 50 – 60 times per page. The combined effect of these habits compels you to read so slowly that your mind wanders and loses concentration. Brainpower training teaches you techniques to overcome these poor reading habits. This allows your reading rate to automatically increase by 3 or 4 times with better comprehension, concentration and memory. You should contact us for your custom quote here. But is it really worth it? Does speed reading really help? Using the techniques you learn in the Brainpower course, everyone at least doubles their reading rate easily and immediately. Guaranteed. If a manager earning $80,000 per annum, spending 12% of their time on-the-job reading (about an hour a day), doubles their reading rate without loss of comprehension, they improve their overall efficiency by 6%. That’s a potential saving of $4,800 per annum. Train 20 employees, it’s $96,000 saved in time efficiency. Would you agree this is a good ROI (return on investment)? Think of all the time you and your team will save once you complete this course! 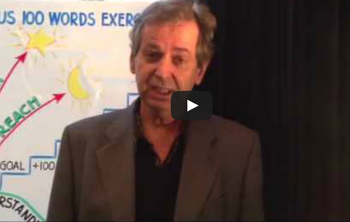 What do people say about our Speed Reading workshop? information overload with this award-winning workshop. will help you improve your reading rate by up to 10 times with the same or improved comprehension. so that they can find facts faster, improve levels of concentration and pass exams with confidence. Read more in 90 days than you have in the past 9 years. We’ve tracked participant improvement statistics over the last 6 years. 22% increased 4 to 5 times. 37% doubled their reading rate. 8% increased 6 to 10 times. If you’re a busy executive with too much to read or university or high school student, then attending this one-day workshop is a must . . .
double, triple, quadruple or better your reading rate with the same or improved comprehension. Here’s a personal video message from Nina Sunday. how would that improve your productivity, your life? During the one-day workshop, you can expect an instant result. Experience the success that comes when you take your reading to the next level. Most people tell us our approach to training is interactive and fun. They love the style of the workbook too. And we don’t use any speed-reading machines at all. Machine-based courses are boring and gain only mediocre results. Nina Sunday pioneered Speed Reading and Memory and Learning workshops for over two decades, so you’re in good hands. The Australian Institute of Training and Development awarded our speed reading course an Innovation in Learning award. For answers to typical questions, click on ‘FAQ’ tab above. without loss of comprehension? Read on . . .
1. Firstly, do you ever find yourself reading and rereading the same paragraph or line over and over? ‘What’s that all about!’...and have to read it again? it’s way too slow for your brain, so you lose concentration. you become more deeply engrossed while you’re reading. So we fix the ‘losing concentration’ problem. 2. Secondly, have you ever noticed you hear the words silently in your head as you’re reading them? You mentally say every word? Try this exercise . . .
Open up something to read, and read it silently to yourself. Hear all those words rolling around in your head as you read? Do you mentally say every word as you are reading? It slows you down to speaking speed, which isn’t very fast is it? not just as slow as they can SAY words. So our techniques fix sub-vocalisation as well. 3. Thirdly, have you ever watched someone’s eyes as they’re reading? You’ll notice their eyes stop and start while they read? Their eyes jerk or bounce along the line? That problem is called lack of fluency. rather than a skilled driver who drives in one smooth direction. Lack of fluency slows down your reading rate. so you read smoothly, with no stopping and starting. 4. Now, another problem with eye movement is Regression. most people don’t even know they’re doing it. The average reader regresses – wait for it – around 50 or 60 times per page! And you don’t consciously notice it, yet it really slows you down. your reading rate goes up. 5. Finally . . . how many WORDS do you SEE at one time while you read? Probably only one word at a time? Would that be right – the one you’re reading? with a very narrow focus. And that’s called fixation. Did you know speed-readers can read WHOLE LINES at a time? That’s around 10 words at a time. (instead of just one word). so you become a faster reader. that’s where you save time as well. So to summarise . . .
and your reading rate AUTOMATICALLY goes up. so you take in more words at a time and your reading rate massively improves. Afterwards you’ll wonder why you didn’t do this years ago. What organisations schedule Brainpower Speed Reading for their staff? 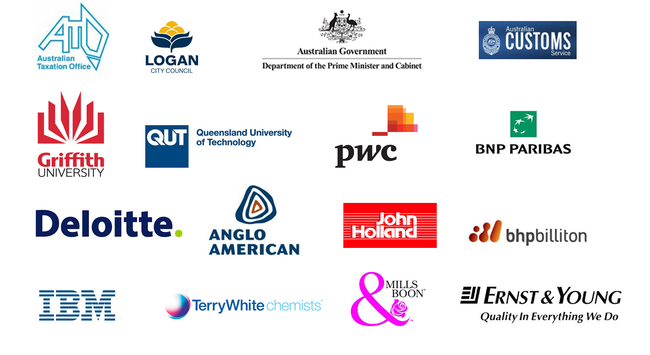 Organisations like Department of Prime Minister and Cabinet, Griffith University, PricewaterhouseCoopers, QUT (Qld University of Technology), ANSTO (Australian Nuclear and Scientific Technology Organisation), IBM, Dept of Defence, Ernst & Young, Commonwealth Bank, and a long list of other corporate and government clients chose us to deliver this program to their staff. So you’re talking to the experts.